Image Size: 19.75 X 13.75 in. Scooby-Doo first aired on television in 1969, and still plays regularly today, making it one of the longest running animated programs in TV history. “Jeepers It’s The Creeper” was inspired by the hit TV series. The characters were designed by Iwao Takamoto. 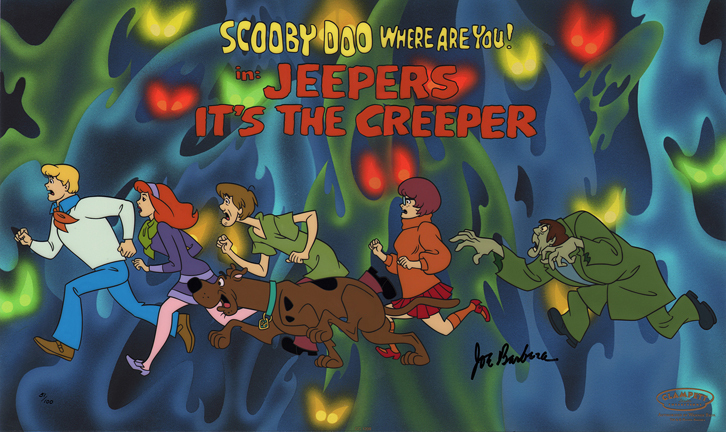 Adapted from an authentic Scooby-Doo title card, “Jeepers It’s the Creeper” portrays the classic imagery of Scooby and The Gang running from The Creeper, one of the more infamous villains in the classic 1970s Scooby-Doo series. The edition is hand-numbered, and has been hand-signed by legendary animation director Joseph Barbera.